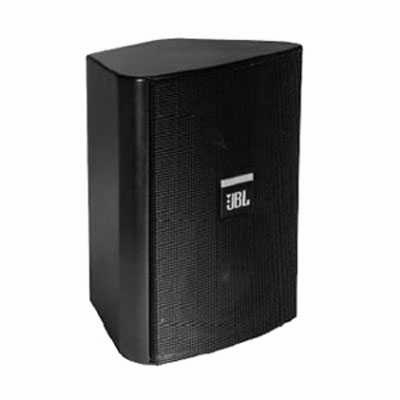 JBL Control 25 Surface Mount Speaker DJParts - All Variety of Parts that DJ Needs.  SonicGuardTM overload protection.  130 mm (5¼") polypropylene coated woofer, 10 mm (¾") titanium coated horn-loaded tweeter.  Includes InvisiBall ® mounting hardware and sealed input panel cover.  Screw-down input terminals. Premium performance capability and even coverage ensures excellent sound quality throughout the listening area. Magnetic shielding allows use of the speaker in close proximity to video monitors. The top-quality transformer, with reduced saturation, allows use on either 70 volt or 100 volt distributed speaker lines, with similar performance fidelity. In the bypass position, the high 8 impedance allows use of more speakers on a loudspeaker line. The unique, global patent pending InvisiBall ® mounting method is simple to install, aims easily, and provides a high degree of theft deterrence. The cabinet accepts a variety of paints to match any décor. Weather resistance is maximized by a stainless steel grille, which is paintable. Coating the woofer in polypropylene and terminating its circumference in JBL’s WeatherEdgeTM, a seamless, butyl rubber extension of the woofer surround, protects critical transducer elements. The polycarbonate tweeter diaphragm is reinforced with a thin film of titanium for added rigidity and endurance. Nickel/zinc rust-resistant terminals ensure a secure input connection. JBL’s exclusive SonicGuard overload protection is virtually inaudible to the listener, ensuring reliability while providing full fidelity sound.